Presented by the Artist, thence by descent. M. Hepworth Dixon,‘Onslow Ford ARA’, The Magazine of Art, 1892, p.238, repr. p.329; Edmund Gosse,‘The New Sculpture, 1879–1894’, The Art Journal, 1894, p.282, repr. p.306; E.T. Cook, A Popular Handbook to the Tate Gallery, London 1898, p.279; M.H. Spielmann, British Sculpture and Sculptors of To-day, London, 1901, p.55; Susan Beattie, The New Sculpture, New Haven & London, 1983, pp.153–55, pl.144. This is an exceptionally rare cast of which only three were ever made.The two others are both in museums - the Tate and the National Galleries of Scotland. Onslow Ford was one of the most gifted of the generation of New Sculptors and this sculpture made his reputation.‘It made the fortunes of its creator’ confirmed the critic Marion Hepworth Dixon,‘for here in a seductively direct and simple realisation the sculptor both found and made his special gifts’ (‘Onslow Ford ARA’, The Magazine of Art, 1892, p.238). Ford was principally a great innovator, experimenting with naturalistic treatments of the body and, in other works, the use of exotic materials. In Folly he rejected all classical prototypes and conventions of ideal beauty and presented the embodiment of Folly as a girl poised precariously on the edge of a dangerous rock. Ford’s superb casting allowed enormous detail and created a deeply sensuous surface. It was made using the lost-wax process – casting bronze in a mould taken from a detailed wax model.The artist even pressed strands of animal hair into the wax to create the effect of her hair, which contrasts so satisfyingly with the smooth, undulating surface of her body. Such attention to surface detail even led critics to complain that the work was too life-like to be acceptable as sculpture, although this may have been led more by moral concerns.There is a similar contrast also between the torso and the rough rock upon which the figure stands. Mr Ford exhibited a highly interesting and beautiful statuette of ‘Folly’ ... something new, something poetic, almost naturalistic. An adolescent girl ... stands on the insecure foothold of a slipping rock, beckons to her companions to join her there, and points onwards with careless glee to some other adventure more precarious still. It is the thoughtless age of life which is here given us, and which is emphasised by a figure that has been rapturously criticised for the ‘flower-like grace of the torso’, and the beauty of the ‘stalk-like legs’. 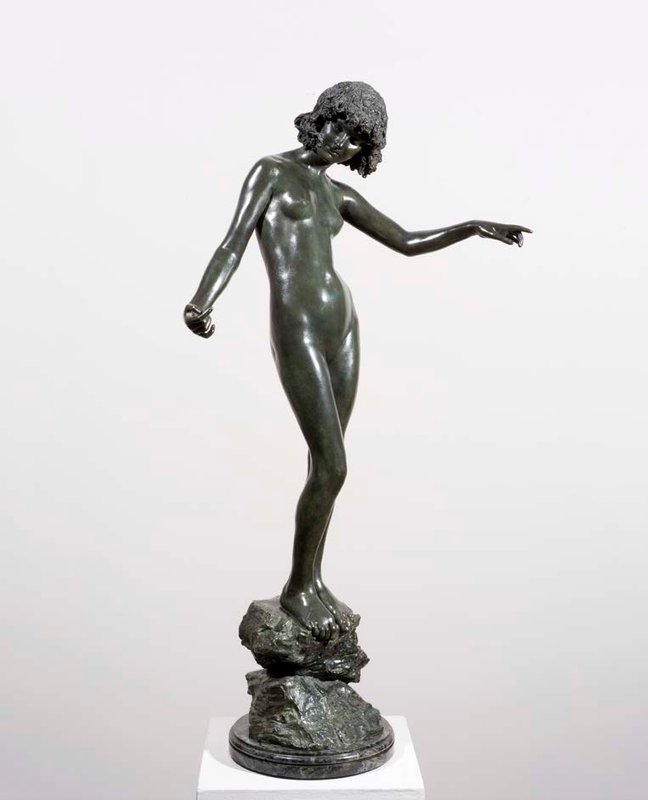 It is enough to draw attention to the delicate yet sufficient modelling, the graceful line of the figure, and the extreme felicity of expression so completely realised.The Royal Academy showed its favour by acquiring the work for the Chantrey collection, and electing the sculptor into its fold.